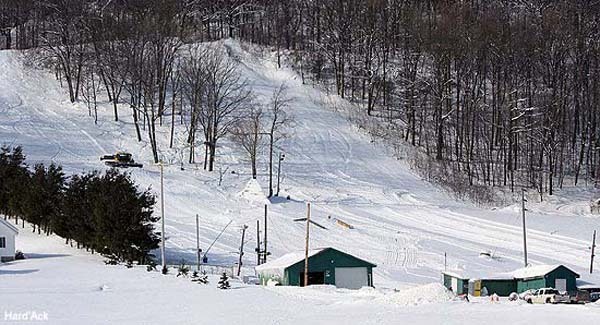 Located on the southeastern slope of Aldis Hill in St. Albans, Vermont, Hard'Ack is a small, non-profit recreational facility that features downhill and cross country skiing, snowboarding, ice skating, and sledding during winter. Hard'Ack's skiing history dates back to at least the 1965-66 season, when Hard'Ack, Inc. was registered in the State of Vermont as a business entity. The ski area likely closed at some point in the 1990s, reportedly due to a lawsuit. Locals later joined together to reopen the ski area. Snowmaking may have been added for the 2003-04 season. The ski area continues to operate to this day, serviced by a rope tow. "I grew up in St Albans in the 80's and we ALWAYS went to Hard'ack. Whether it was for sledding in the winter, or biking/hiking the trails, it was always fun. And kept us out of our parents hairs for HOURS!!! Great memories as a kid. From the look out point on the west side to the stone plack of the grey wolf that was shot there. Herb Mitchell was my neighbor as a kid. From what I understand he was one of the people to donate time, resources, and fabricate the tow rope system. Hopefully they find a way to remember him for his help." "I remember skiing there for the first time in 1974, the cabin at the top of the rope tow contained half of a Pontiac with no doors. It had the tow rope connected to the rear differential. A man sat in the seat and operated the car which pulled the skiers up the hill. He said he had no need for the doors so sold them to a skiier that had an identical Pontiac." "I was one of the reincarnators, the above statements are pretty accurate. The Hard'ack Trustees shal be building the Greg Brown Lodge a 64'x54', 1 1/2 story structure."